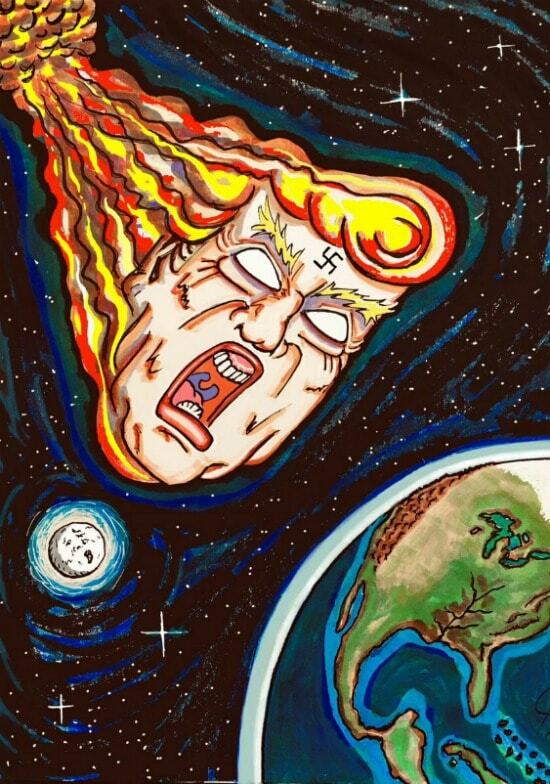 Actor/artist Jim Carrey went after Donald Trump again on Thursday with his latest artwork, bringing a religious spin to his latest dig at the president. The message was an apparent reference to the immigrant children who have reportedly been separated from their families — and, given the Ayatollah-ish facial hair and headwear that Trump is sporting in the artwork, a call-back to the Iran hostage crisis of the late ’70s and early ’80s. Check out Carrey’s latest below. 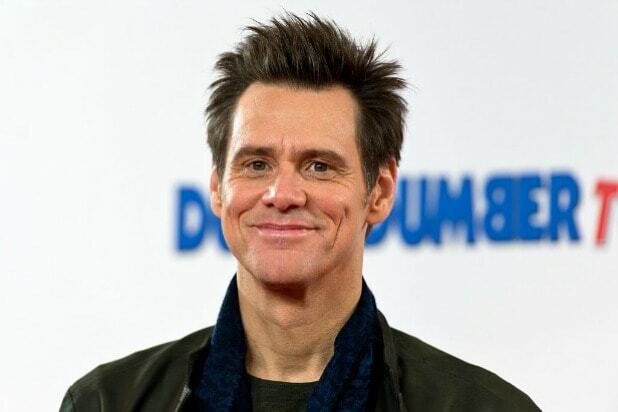 Jim Carrey has made his disdain for the current state of politics an artform... literally. The Oscar-nominated comedian-turned-actor's series of drawings depict all that he believes to be wrong in D.C., from foreign policy to separating immigrant children from their mothers to the GOP in general. Here are just a few of his many objets d'art. March 17, 2019 "Innocent people are now being slaughtered, families ruined and childrens' lives destroyed. All in his name. If the Craven Republican Senate allows this vile miscreant to continue encouraging devisiveness, the "Trump Presidency" will become an EXTINCTION LEVEL EVENT." Feb, 27, 2019 "If Trump makes a nuclear deal w/ North Korea, it's a FRAUD: China and Russia trying to keep their Prize Pony in the White House. When there's a Nobel Prize for cowardice and moral desolation Trump will be the first to receive it." Jan. 30, 2019 "The New American Dream! Get rid of this filth and bring our blue skies back." Jan. 10, 2019 "34 journalists were murdered last year because tyrants like Trump demonized them for doing their jobs. Maybe this year he'll get a new bone saw for his bday from his pal, the Saudi Slayer, and they can chop up the next body together. That's what 'fiends' are for!" Jan. 8, 2019 "When Trump tries to frighten and decieve the nation tonight, remember to follow every sentence that comes out of his mouth with, "HE LIED!" (7000 + so far) Don't let him turn you into a clown, too busy juggling his lies to see the edge of the cliff." Dec. 31, 2018 "One last tweet about this Stinker for 2018. Remember -- no matter what #PresidentNeverWas says in the New Year... THIS IS NOT A PIE. Happy New Year, Everyone!" Dec. 21, 2018 "WE'RE LOSING HER!" Dec. 2, 2018 "Ain't nuthin but a G-20 thing, baaaabay!" Nov. 19, 2018 Nov. 18, 2018 Nov. 11, 2018 "Guess who cut the funding for fire management in California then blamed the fires on mismanagement? How do YOU spell infantile?!" Nov. 6, 2018 "Shameless lies. Endless indictments. The rise of racist hate groups. Kidnapped children. Contempt for rule of law - and quite possibly TREASON. Let's end this ill-wind that's blowing America off-balance and turning us against each other. VOTE DEMOCRAT!" Nov. 4, 2018 "Go Beto! Go Democrats! Vote like there's no tomorrow. Let's make this Tuesday like the end of every great vampire movie. Pull back the curtains and let the sunshine turn all those bloodsuckers to dust." Oct. 30, 2018 "The GOP are now completely invested in Trump's economy of LIES. They say they're gonna give you HEALTHCARE while working to destroy it. They make up lies about refugees while KIDNAPPING INNOCENT CHILDREN! Vote Democrat. Help save the future. DON'T FOLLOW THE RED HAT TO HELL!" Oct. 24, 2018 "Today they tried to murder two Presidents as well as public servants and journalists. Make no mistake, these terrorists were encouraged and emboldened by the hate speech of Donald Trump. If you can't see the clear menace of this man's influence by now then you are a part of it." Oct. 12, 2018 "From the bowels of the White House he shrieked, hurled curses and tweeted bile -- because that's what demons do. YOU are the Exorcist. Vote Democrat for goodness' sake." Sept. 25, 2018 "The monster is out of control. Vote for your lives!" Sept. 5, 2018 "Thank you @Nike for just doing it. #CapitalismWithAConscious" Aug. 22, 2018 "Figuratively speaking #BURNTHEWITCH" Aug. 21, 2018 "Manafort, GUILTY! Cohen, GUILTY! Flynn, Guilty! Gates, Guilty! What's happening to All the Best People? 'Ladies and Gentlemen! Children of all ages! Can the Great Spewdini spew enough lies to escape the straight-jacket of his un-Presidented criminality?'" Aug. 18, 2018 "Down and down they went. Lower than any administration in history. Arthritic knees creaking and burning, Giuliani's hammy thighs chafing in the wet heat of his Master's crypt. It seemed like the bottom was nowhere in sight." Aug. 17, 2018 "40 innocent children killed on a bus in Yemen. Our ally. Our missile. Our crime." Aug. 13, 2018 "The Old Man and the Sea of Corruption. So many bottom feeders like Commerce Secretary Wilbur Ross getting snagged and dragged to the surface. Mueller's gonna need a bigger boat!" Aug. 1, 2018 "Squeeze Mueller Squeeze!" July 30, 2018 "Sorry, family farmers. You picked the wrong guy to protect you." July 26, 2018 "Great men and women once occupied these desks. The House of Representatives, 1789 - 2016." July 7, 2018 "Then, quickly Trumpy McMonkey McBean Put together a very peculiar machine. And he said, "You want stars like the fancy elite...? My friends, you can have them -- just drop at my feet!'" June 25, 2018 "So I fixed the controversial TIME Magazine cover. This is much more appropriate. You're welcome" June 24, 2018 "Christianity, Trump style: 'Jesus was a loser. A failed carpenter. He's a savior because he was crucified. I like people that weren't crucified.' vote.gov" June 19, 2018 "'If the Democrats would just stop the Mueller investigation, build a wall, declare me a God and pass a special law allowing me to marry my hot daughter I wouldn't have to devour these immigrant babies. It's terrible what they're doing. Obstructionists!'" June 11, 2018 "Let's Make A Deal: You'll be a real world leader. I'll sway the midterm elections. And together we will save the world from the bloodthirsty Canadians." June 7, 2018 "Give us your huddled masses yearning to breathe free...and we will lock their children in cages with tin-foil blankets. And scar them for life! You know: The American Dream!" May 27, 2018 "1500 innocent children ripped from their mothers' arms at our border. Lost in Trump's "system". Give us your tired, your poor, your huddle masses yearning to breathe free -- and we will torture them for wanting a better life. From Shining City to Evil Empire in under 500 days." March 23, 2018 "Fifty Shades of Decay" March 21, 2018 "Lawyer and lucky charm Joe diGenovia hopes to put Dirty Donald's troubles in the rearview mirror. But the objects in the mirror are closer than they appear. ;^P" March 19, 2018 "If you liked my last cartoon you may also enjoy... "THE WICKED WITCH OF THE WEST WING AND PUTIN'S FLYING MONKEYS"" Feb. 25, 2018 "Oh say, can't you see?! " Feb. 22, 2018 "Great news! The President's answer to school shootings is to arm the glee club! ;^P" Feb. 11, 2018 "All who enter his crooked carnival with integrity are doomed to leave without it. General Kelly has been trampled by his own compromise. Who dares be the next to ride the carousel of fools?! Muahahaha!!! " Feb. 10, 2018 "Can we continue to rely on the remains of dead animals for food or fuel? Are Big Oil, Coal and Cattle ancient dinosaurs that will lead to our extinction?" Jan. 24, 2018 "11 school shootings in 24 days. The new Norm!"